Studies the regulation of cellular metabolism in the context of cancer and genetic disorders. The Birsoy lab studies how metabolic pathways regulate biological processes and contribute to diseases including cancer, mitochondrial disorders, and inborn errors of metabolism. Using genetic and metabolomic tools, Birsoy studies the mechanisms by which human cells alter their uptake and use of nutrients to adapt to the genetic and environmental stresses observed in these disorders. Through a series of chemical reactions collectively known as metabolism, an organism extracts and harnesses energy from organic matter. While the core components of this process are relatively well understood, little is known about how an individual cell rewires its metabolic pathways under varying circumstances, including disease. Using forward genetic approaches, Birsoy’s lab studies the regulation of metabolism in mammalian cells with the long-term goal of developing therapies for relevant diseases. His group studies cellular metabolism in the contexts of cancer, mitochondrial disorders, and inborn errors of metabolism. There is increasing evidence that genetic alterations modify the metabolic program of cells. Since cancer cells are dependent on these changes in metabolism for proliferation, there has been a great interest in exploiting these metabolic liabilities for cancer therapy. As a postdoc at the Whitehead Institute of MIT, Birsoy investigated cancer cells’ metabolic response to the nutrient-deprived environment found within tumors. 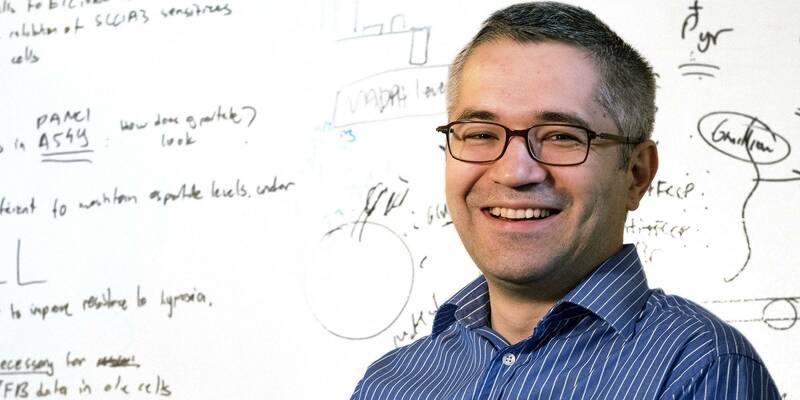 Using the Nutrostat, an instrument he designed to test cells’ response to low-nutrient environments, Birsoy discovered several biomarkers, including mitochondrial mutations for glucose sensitivity among different cancer cells. Subsequent experiments showed that these mutations conferred susceptibility to mitochondrial inhibition by biguanides, a class of diabetes drugs. To expand upon his previous work, Birsoy’s lab is systematically mapping out cancer cell dependencies on other nutrients, such as amino acids and lipids, while simultaneously looking for opportunities to exploit them for cancer therapy. Understanding the molecular basis for these dependencies will help unveil new metabolic programs and may aid in the development of innovative strategies for cancer treatment, including traditional compounds designed to inhibit intracellular enzymes as well as nutritional approaches to eliminate cancer-feeding metabolites from the blood. Birsoy is also interested in understanding mitochondrial dysfunction, a common feature of many diseases including cancer and mitochondrial disorders. Current therapies are limited for mitochondrial disorders, which are characterized by multi-organ dysfunction, and symptom management remains the primary treatment option. This is due in part to a lack of validated drug targets and the absence of relevant disease models. Using a combination of genetic and metabolomic tools, Birsoy’s lab is examining how mitochondrial dysfunction affects cellular metabolism to give rise to these various disease phenotypes. In addition, the Birsoy lab studies inborn errors of metabolism, rare genetic disorders like organic acidurias, in which metabolites accumulate to toxic levels. This metabolite buildup causes a wide array of symptoms, including damage to the liver and brain. Birsoy’s lab aims to better understand the mechanisms by which metabolites damage specific organs. A fuller understanding of these mechanisms may lead to novel therapeutic strategies for rare genetic disorders. Birsoy, K. et al. An essential role of the mitochondrial electron transport chain in cell proliferation is to enable aspartate synthesis. Cell 162, 540–551 (2015). Birsoy, K. et al. Metabolic determinants of cancer cell sensitivity to glucose limitation and biguanides. Nature 508, 108–112 (2014). Chen, W.W. et al. Inhibition of ATPIF1 ameliorates severe mitochondrial respiratory chain dysfunction in mammalian cells. Cell Rep. 7, 27–34 (2014). Birsoy, K. et al. MCT1-mediated transport of a toxic molecule is an effective strategy for targeting glycolytic tumors. Nat. Genet. 45, 104–108 (2013). Birsoy, K. et al. Untuning the tumor metabolic machine: targeting cancer metabolism: a bedside lesson. Nat. Med. 18, 1022–1023 (2012).